Ordinary light bulbs lack flair. So we’re putting a spotlight on some amazingly designed lights and lamps that truly shine. Take for instance the colorful tree stealing the scene in the image above. Achieved by strategically stacking TwistTogether LED blocks, this clever, functional decor is a real show-stopper. Glide TwistTogether Light Lamps also come in more subdued hues, and they’re like the LEGO bricks of the lighting world — since you can safely stack and combine these low-power, cool-to-the-touch blocks of light with ease. These LED flower lamps are as elegant as they are useful, and they boast innovative lighting technology which enables them to emit a warm, soft glow. One-of-a-kind bird house night lights would look charming perched anywhere in your abode, and they are hand-crafted from natural Japanese Kiri wood and hand-painted using non-toxic paint. Add a touch of playfulness into study time with these LEGO inspired LED desk lamps that will no doubt shed some light on your child’s homework. Wes Bennett’s chalkboard lamp, made from an upcycled pot is whimsical and stylish, beckoning passerby to scrawl an enlightening message across its surface. For camera buffs, it doesn’t get any flashier than these vintage cameras turned into nightlights. And what better way to light the way through the night than with these LED orchard nightlights that cast an enchanting glow to illuminate a child’s bedroom? Ordinary light bulbs lack flair. So we're putting a spotlight on some amazingly designed lights and lamps that truly shine. Take for instance the colorful tree stealing the scene in the image above. 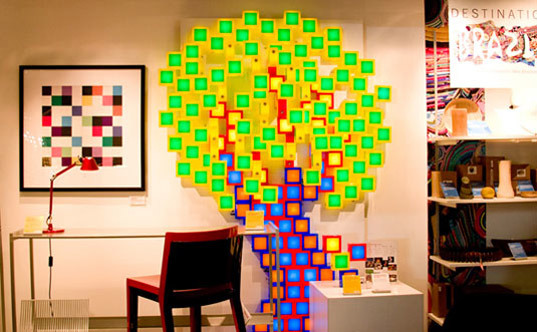 Achieved by strategically stacking TwistTogether LED blocks, this clever, functional decor is a real show-stopper. Glide TwistTogether Light Lamps also come in more subdued hues, and they're like the LEGO bricks of the lighting world -- since you can safely stack and combine these low-power, cool-to-the-touch blocks of light with ease. These LED flower lamps are as elegant as they are useful, and they boast innovative lighting technology which enables them to emit a warm, soft glow. One-of-a-kind bird house night lights would look charming perched anywhere in your abode, and they are hand-crafted from natural Japanese Kiri wood and hand-painted using non-toxic paint. Add a touch of playfulness into study time with these LEGO inspired LED desk lamps that will no doubt shed some light on your child's homework. Wes Bennett's chalkboard lamp, made from an upcycled pot is whimsical and stylish, beckoning passerby to scrawl an enlightening message across its surface. For camera buffs, it doesn't get any flashier than these vintage cameras turned into nightlights. And what better way to light the way through the night than with these LED orchard nightlights that cast an enchanting glow to illuminate a child's bedroom?